Television Cast, 1972 (Columbia/no CD) (1 / 5) In 1972, with “Archie Bunker for President” bumper stickers on every Ford Pinto and a theater-of-the-absurd presidential race in full swing, CBS trotted out Of Thee I Sing as a vehicle for some of its top sitcom stars. 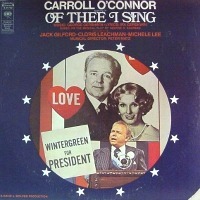 Carroll O’Connor played Wintergreen, and the network advertised, “Tonight: Archie Bunker becomes President!” O’Connor displays a serviceable Irish tenor and a nice way with a lyric. His Mary, Cloris Leachman, is similarly passable, and Michele Lee is a high-voltage Diana Devereaux. Otherwise, this hard-to-find LP is not worth the search. 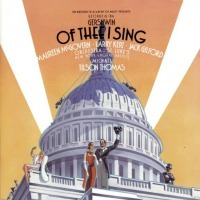 The score is garishly orchestrated and conducted, and the generous helping of laugh-track-supported dialogue that’s included confirms one’s suspicions that this is a fatally dumbed-down adaptation of the original show, replacing the smart Kaufman-Ryskind dialogue with exchanges better suited to Green Acres. — M.M. 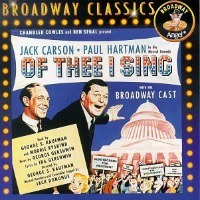 New York Concert Cast, 1987 (Sony, 2CDs; paired with Let ‘Em Eat Cake) (2 / 5) Conducted by Gershwin scholar Michael Tilson Thomas and presented with great fanfare at the Brooklyn Academy of Music, a 1987 concert version of this gem of a show yielded a studio recording that is the most complete, most faithful Of Thee I Sing album available. Unfortunately, gleeful as the material is, the presentation is a little stiff. Larry Kert as Wintergreen is a fine singer, but here he exhibits all the personality of tofu. Maureen McGovern as Mary Wintergreen has more presence but less to do. Jack Gilford, who had played Throttlebottom on TV, is endearing — but, by this time, his voice had aged and weakened almost to a whisper. The best performance comes from Paige O’Hara, whose Diana Devereaux is vocally secure and dizzily funny. Yet even she over-punches her line readings; I smell a director who insisted on socking everything across the footlights, even in the recording studio. The digital stereo helps bring out the brassy orchestrations, and the notes in the accompanying booklet are authoritative. — M.M.